Take the Challenge. Invest in the Development of Leaders. Sign up for a Tour of Duty! 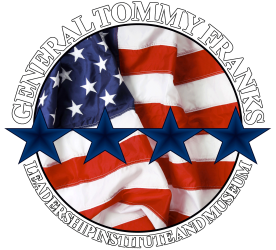 The General Tommy Franks Leadership Institute and Museum needs your help. GTFLIM is dedicated to the preservation of history and the development of leaders. “Leadership. Patriotism. Service.” Over the past year, GTFLIM has invested in the lives of thousands. Your gift of $25 per month will provide programming for 100 students, $50 per month will provide a new educational interactive kiosk, $100 per month will provide for a regional leadership training workshop and $250 per month will provide for the development of a new display which will enable GTFLIM to more effectively communicate history and leadership principles. EVERY gift is a significant investment in the lives of others! GTFLIM is a tax exempt 501(c)(3) organization. Tax ID 20-5260489. Charitable contributions are deductible as allowed by the rules and regulations of the US Tax Code. We will only use your phone number for billing related issues and will NEVER share it with others! By providing your email address, you will be automatically enrolled to receive our periodic newsletter to keep you informed of GTFLIM programs and events. You can cancel at anytime, and we will NEVER share your email with others! $25 per month for a year. $50 per month for a year. $100 per month for a year. $250 per month for a year. Other amount per month. One-time gift. By selecting "YES," I acknowledge that I am committing to a Tour of Duty and making a pledge to support GTFLIM programs and events through my contribution.